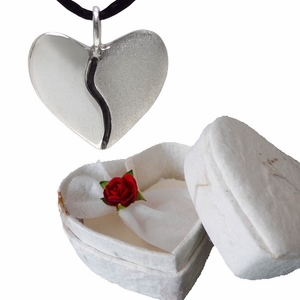 A heart shaped box... Made of paper and flower petals and stems... each is a little different mix. 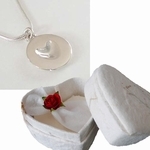 Within is a simple white pouch held closed with the stem of a tiny red paper rose. Open this pouch to reveal a meaningful Harmony Heart. An antiqued finish gracefully spirals down the center. This unique pendant (7/8" wide) is set off by a dramatic 16" black chain.